It's a cold and dreary day and all I want to do is slump at my desk, mainlining cups of tea, but an old school-chum M wants to meet with hubby and me for lunch. M now lives abroad and only comes back for very brief stints, so we're lucky to get a slot in his busy diary. Tottenham Court Road's the venue, so I rally the Twitterverse to ask where we should dine. Some suggestions are less than helpful (thanks Dan for “McDonald’s”) but Catty’s tip of Koba, a Korean joint, seems just the ticket - what could be more warming than a hearty jjigae? I'm the first to get to the designated meeting spot, across the road from Big Freddy Mercury. Hubby turns up next and immediately warns me not to steamroller M into going somewhere I want to go. Poo. Then M arrives and asks us where we should eat. I reel off a number of options and perhaps my psychic powers are stronger than I realise for he immediately replies "Ooh, I fancy Korean". Koba is a little tucked away in Bloomsbury, so trying to wing it without a map is a bit foolhardy. However, I have a vague idea that it's somewhere near Computer Exchange and the bizarrely-named boutique Multipazz and thankfully find the place. We sit down and M asks what the big overhead lamps were for. "Tabletop barbecue - they're extractor fans" I reply. Of course, M then wants to try it, but we convince him it'd take too long (as we have to get back to our desks) and steer him towards the one-dish options. "I've been hearing a lot about this 'kimchi' thing", says M. "Since we're here in a Korean restaurant, I feel like we should eat some. Shall we order some? Can we order some?" 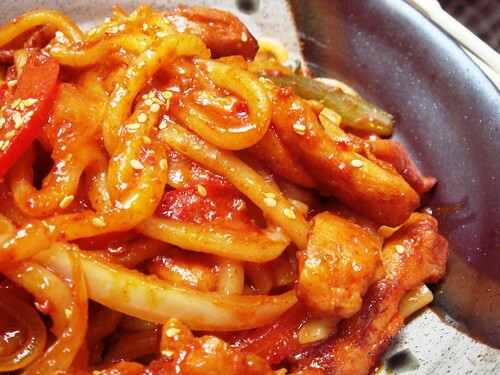 We're more than happy to indulge this whim, so we ask for the mixed kimchi to start. A platter of Jenga-ed veg arrives - daikon, cucumber and the traditional Chinese leaf. We swoop with chopsticks - or at least hubby and I do, whereas M apologises and says "I'm going to be really embarrassing here and ask for a fork". The waiter swiftly obliges and brings cutlery for M ... and for hubby and me. We all get tarred with the gawky brush. Anyway, this isn't as embarrassing as when M notices me taking a few snaps with my little point-and-shoot and asks far too loudly "Oh, are you going to review this place? You know, on your food blog?". In the distance, I swear I hear a plate smash. 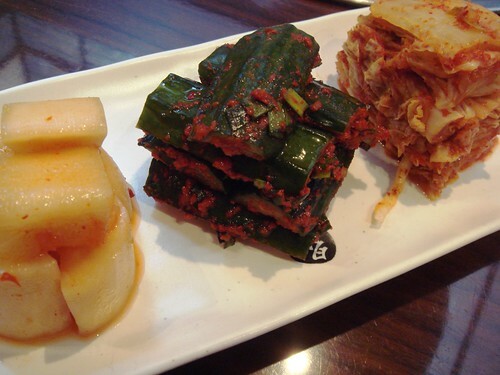 The kimchi is good - crisp, tart and pungent, and I want more, but I know I'll regret it later. For our mains, we've opted for seafood noodles with soy or spice (M), dolsot bibimbap (hubby) and sundubu jjigae (me). 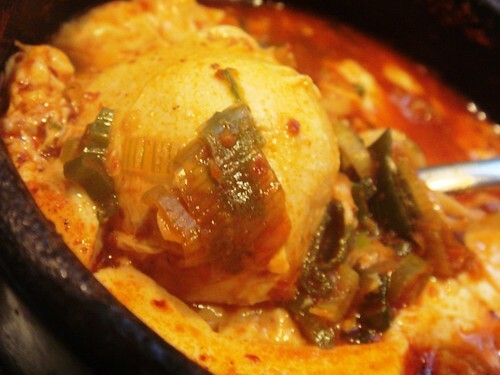 This soft tofu and egg stew is my go-to Korean dish - I absolutely have to order it. M asks for spicy but not too spicy - seafood's scarce in the sleepy little town where he lives, so he doesn't want this treat to be overwhelmed with chilli. The waiter reassures him that it will be exactly how he likes. We chat for a while and then our steaming dishes arrive. Sure enough, they've judged the heat of M's noodles perfectly, and he is pleased, although this is shortlived. Visibly perturbed, M spears a chunk of protein with his fork and waves it at us. "This isn't seafood, is it?" he says, "this is chicken. Didn't I order seafood? I'm sure I ordered seafood". We shrug and say we think so, but we tuned out when they were discussing relative spiciness. Indignant, M calls over the waiter and asks whether he did in fact order seafood noodles. The waiter looks perplexed, rechecks his notebook and then crumples with embarrassment when indeed it turns out the customer is right. He apologises profusely and offers to replace the dish, but M seems satisfied and says "No, no, the other food will get cold. I just wanted to confirm that I wasn't going mad" and proceeds to tuck in. I want to stuff my napkin in my mouth to stop myself from laughing. 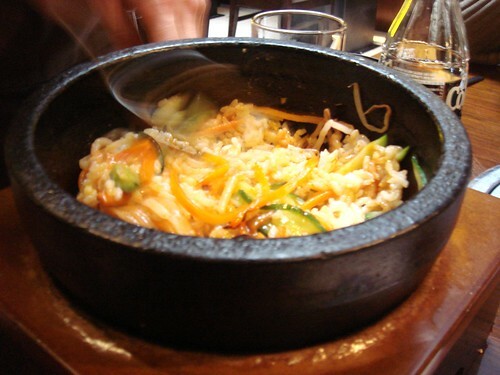 As for our dishes, hubby's stone bowl of dolsot bibimbap sizzles enticingly on its wooden plinth. Another waiter (the original having dissolved into mortification) squeezes gochugang chilli sauce onto the rice and beef and then whip, whip, whips it into submission before letting my husband dig in. Hubby loves it and says it's just what he needed, but, as with okonomiyaki, I find the taste of bibimbap only half as entertaining as the theatrics leading up to it. I'm far more interested in the wee bubbling cauldron of fire in front of my nose. Generous chunks of tofu and clams bob around in volcanic red broth, but the prize is a luscious soft-yolked egg poached in the lava itself. Ohhhhhh - it's spicy, it's savoury, it's intense, it's like, it's like there's a party in my mouth and everyone's invited. The rest of the meal is a bit of a blur. I expect M and the hubby continue to talk, but I'm too focused on shovelling stew and rice into my mouth to notice or care and, between chews, I'm tempted to burst into song (and a certain Kinks tune drifts into my mind). Koba, dear Koba, has completely won me over with that one little dish and I cannot wait to go back for more. Have tried to get in to Koba 3 times now at night but it's always packed. Good idea to book ahead at peak dinner times. Sounds worth it! 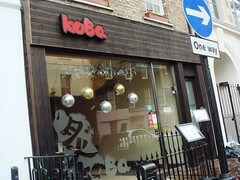 I've never been to Koba, but I have heard so much about it - silly really as I work 10 minutes away. 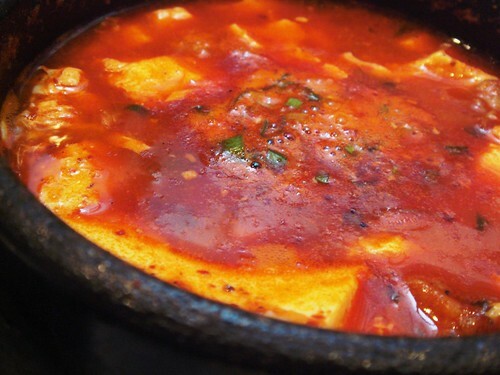 That jjigae sounds like just the ticket for these dreary grey days. Oh me oh my - let me know if you're going back, meemalee - I want to come too! Yes, I'm so glad my friend works close by so it's easy to persuade her to lunch there. 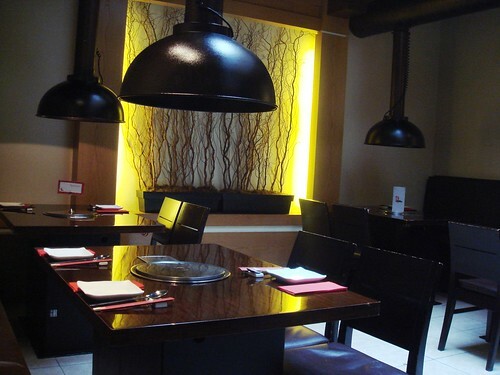 Koba is some of the best Korean I've had in London - wish there was more! @Lizzie - It's quite easy to miss but oh the jjigae - soooo good. @M - Sadly it's just a touch too far away for me to go regularly at lunchtime - I can't believe I never knew about it before. @gastrogeek - Go - it's dirt cheap and so lush! @Scandilicious - Twitter can be very, very useful sometimes. Definitely one for the list! I haven't had Korean food in so long and I miss it! The results you get from a point and shoot are wonderful. The food looks brilliant and your review is excellent as ever. Damn, I'm sooo huuungry! @Su-Lin - I wish Koba was closer to my office! I had to take a long lunch and still barely made it there and back.